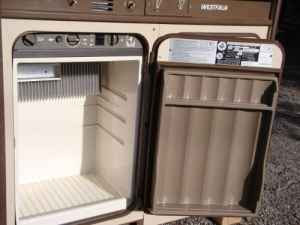 Both a blessing and a curse, the dometic model fridge in the westfalia van is a strange creature. The fridge operates off of an ammonia evaporation cycle, basically the liquid gets heated into a hot pressurized gas state, heat gets vented off but still has pressure, goes through an opening which lets it expand and cool down quickly, then turns into a liquid to repeat the cycle. The fridge operates off of three power sources, 120v AC, propane and 12v DC. The best power source is 120v AC, you can make tiny ice cubes and never have to worry about the propane gas and if it is still working or not. With propane mode there is a funky start-up cycle (I hope to do a starting video because I couldn't find any online) but once on it is supposed to operate continuously till you turn it off and supposedly wont go out when driving. The 12v mode comes on when driving around town and is only intended to maintain the current temperature, nothing more. Simple enough except the designers really were not thinking about interior space or efficiency. A stock fridge relies on natural convection currents to cool the items in the fridge. Install a fan on the cooling fins to help circulate the air and help cool things down faster. This will be powered off of the auxiliary battery and probably running all the time. Replace the factory fan on the back with a bigger and better unit. Increase the insulation behind the fridge to keep the heat from radiating off of the body panel and soaking into the fridge. Clean the intake and exhaust pipes, they must be free of debris and the combustion chamber must be absolutely spotless for the propane to burn correctly. Cut the top of the fridge door off and hinge it so you can restart the fridge or change power sources without opening the door. Re-seat the thermal components with new thermal compound. Replace the city water hook-up with a fan to vent the heat from the fridge outside. Replace fridge with a newer unit. Despite the problems it does provide some cooling, storage space, and is silent. Even with these mods, the fridge is still very small and can not compare to a modern compressor driven fridge. I have given up eating meat and dairy so the items I need to keep cool are few; Fruit, veggies, jelly and peanut butter, bread, and OJ plus whatever leftovers I may have.